Please browse our wide selection of Nataya Wedding, Second Wedding, Mother of the bride, Mother of the groom and bridesmaid Dresses. All Nataya Bridal Gowns have a vintage inspired theme which may or may not include dresses form the 1910s, 1920, and 1930s eras. Some of the styles shown here are Titanic, Edwardian, Flapper, Lace, Layered, Flutter Sleeves, informal and retro wedding Gowns. Please browse our wide selection of Nataya Wedding, Second Wedding, Mother of the bride, Mother of the groom and bridesmaid Accessories, featuring a wide variety of Shawls, Shrugs, Boleros and throws. All Nataya Bridal Accessories have a vintage inspired theme which may or may not include dresses form the 1910s, 1920, and 1930s eras. Some of the styles Nataya proudly incorporates are Titanic, Edwardian, Flapper, Lace, Layered, Flutter Sleeves, informal and retro wedding Gowns. The Nataya Great Gatsby dress in garnet offers a beautiful and classy twist on the 1920s. A small handkerchief-like hemline shows, and the overlaying sheer layer ascends gently up to the neckline and cascades into the sleeves, for a wonderful and different look. The Nataya CL-075 Vintage Style Wedding Dress in Mauve features a corset-style bodice that creates a flattering look, The romantic Edwardian-styled gown features open, sheer, scalloped-edged panels on the bodice and a handkerchief styled, ankle length skirt. Beauty and refinement never go out of style. That’s why the look of this tea dress maintains its distinct sense of enchantment, even into the modern era. The flattering fit, sheer accents, and modest neckline make it the perfect pick for any elegant, upscale event on your busy social calendar. Upscale events and stylish soirees call for a little black dress with timeless appeal. This tasteful drop-waist dress from Nataya is full of impeccable details that will bring your look to life. A tiered skirt, gently sloped neckline, and relaxed fit give this vintage-inspired design an inherent sense of refinement. This beautiful vintage inspired Nataya 40221 Ruffled Tea Party Dress in Black/Gold will make you look elegant and gorgeous with its tea length, 3/4 sleeves cut, embroidery decoration and gold color tones. Match it with gold or black color tones to create the perfect look for any party or event you attend. The Nataya AL-281 Vintage Style Dress in Periwinkle is agarment that will help you show your femininity and bubbly personality at practically any social event that honors the spirit of the Roaring Twenties. Beautifully feminine, this vintage-inspired design will fill you with nostalgia for classic movies and simpler times. The attention to detail cannot be missed, from the sweetheart neckline and capped tulle sleeves to the delicate embroidery and three tiered ruffled skirt. 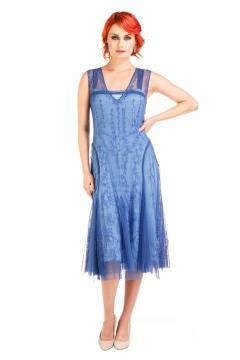 A dress as glamorous as it is whimsical, the perfect piece for any occasion.